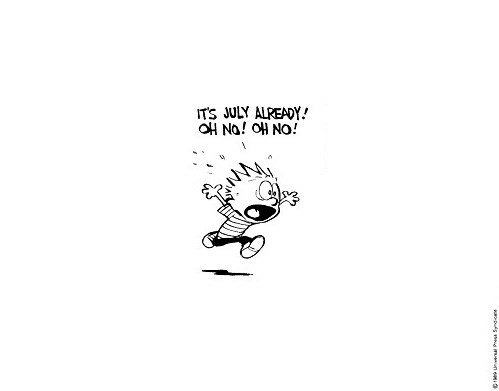 How is it July Already? Here we are in July already - can you believe it? I'm having trouble. It seems like only a few weeks ago it was Christmas, and then New Years, and now it's summer with all that it brings - trips to the cottage or beach, sweltering weather, eating an ice cream cone while sitting on a park bench, visiting relatives, going to camp, and epic road trips. It also brings kids snowsuits for sale at Costco, and Christmas decorations for sale at Michael's, but that's another story. With the year being more than half over (it's scary when I put it like that isn't it?) I though it was time for a check-up on the my list of to-dos that I posted back at the start of 2012. Paint the living room a colour other than white. Actually hang the art on the walls! Get a rug for the foyer that can fit under the door when it opens. Get bedside tables that are not two different sizes. Get a rug for my bedroom. Remove doors into dining room and living room. Increase average posts a week from 1 to 2. Okay, maybe I'll toss in some personal ones too. Alright then. Not a very successful start to the year (at least when it comes to getting some of these completed). Looks like I'm going to have a very busy second half of 2012. What about you? Did you make a resolution/to-do list for 2012? How are you making out? mmm- lavender fields & cherry picking? sounds amazing!